Sending good thoughts for your dreams coming true. Your kindness and your stories always tug at my heart strings and bring tears of joy to my eyes. Because of you, when I’m completely overwhelmed by my own life and just getting through the day-to-day of being a mom, wife, woman, career gal, I take a few minutes every time I see a post from you to remember how good it feels to be kind, to have someone be kind back… your work is important and powerful. THANK YOU! Patience, Patience…everything in it’s perfect time! All will fall into place when it is supposed to! And you will be able to see with the clarity of hindsight and wisdom that the timing was perfect! I am so happy to have stumbled onto you (I don’t even know how I found you). I must tell you that you are me…your vision is the epitome of all that I am! I love doing things to make others feel better about themselves and making this world a little nicer. Today, I am doing your Guerrilla Goodness VDay 11 and I have challenged my friends on fb to do the same! (i posted your link on my fb page) Will keep you “posted” (hot pink for vday of course) on how it went. Keep smiling and thank you for the work you do! Something I have learned as a high school teacher: Smile and greet everyone you can as you move through the day. You will be giving what you can, and will intrinsically get what you need. I love what you are doing here!!! I am with Lydia – your posts totally make me think about my kids and hubby and it reminds me to be greatful and thankful. The way you write and express yourself is awesome/powerful/real. Today I need Patience. Thank you for being you. You know my credo, right? Find the grateful place and the rest comes together. The universe provides what we need. We simply have to celebrate the potential of its presence in our lives and it flows on in. Welcome it! It’s yours. Sending you some fragment of the energy that I imagine it must take fueling your love! Giving what I can amounted to some encouraging posts on facebook about the powerful force of love in action and the ways I witnessed it today, giving thoughtful Valentine’s cards to two of my nephews, three of my nieces, my youngest sister, Momma and my cousin and her family with fruit snacks and sweethearts and praying for those who lack love in their life. Taking what I need; patience as I begin a new job in a new position with people who are pretty great, but are bursting my bubble of personal space; which made me question my sociability; strength to continue plodding along as my family prepares for the one year memorial ceremony for my late sister and missing her like crazy in the midst of it and I need to find that sense of peace in my life that will allow me to rest my body and rest my mind. This is kind of exactly why I find myself here today. It was meant to be. I have come to your site to peruse several different times and have even completed 2-3 of your ideas before, but today, I come here for a slightly different reason. I need to give what I can so I can take what I need…badly!!!!!!!! I have had some really hurtful things said to me over the last few days. Instead of dishing them back hastily or getting super-down on myself, I want to go out and do kindness today! I want to do something to make others feel good. I have taken the mean statements directed towards me, in stride (as much as I can), and as hurtful as those things are and with how easy it is for us to just bark back at people to keep this never ending cycle of meanness going, I have decided to do the harder thing. To take the more difficult path and “take” the mental/verbal attacks and then go out and make others’ day. So, here I am looking for a good idea. This is spur-of-the-moment, so there is not much budget today, but I really came for a “give what you can, take what you need” purpose. Thank you. I encourage everyone to do this. To stop the cycle of “people-bashing,” and go out and do kind for others instead of snapping back impulsively when hurtful things are said. I will follow-up after completion! Thank you! Patience…I just send sooo much love to you right now…even though it may be after the fact…you are due for some big opportunity to just spring into your lap!!! You are kindnessgirl…kind things will come to you…You are so lovely. I’ve been completely overwhelmed lately…being a mom…educator…friend…trying to be in a hundred different places at once…and do you know what?? ALL of those places I go, I try to do something unexpectedly kind. It is sort of selfish because it brings kindness to me and my day, but I also do it because of you and your kind, kind heart. So much love goes out to you today and everyday. I love the bulletin boards in your pictures…you give me so many wonderful ideas…sometimes I’m a little late on them…like the italian dinner—two weeks late…or the trash can kindness—a week late…how about LOVE and valentines…all week this week?? It’s how I am and what I do…late but the sentiment is still there and even moreso because I actually have the energy to embrace it!!! Thank you for you, kindnessgirl. You are in my thoughts and in my prayers and what I need is for everyone who posts to do the same for me. I’ve only recently discovered your blog, but I thoroughly enjoy it, and it brightens my day everytime I read something that you’ve written from your heart. Really great creative and fun ideas in this post for how we can all increase the love in our lives. I am a School Therapeutic Support Clinician and also an art therapist at an Inner City School in Philadelphia. I found your blog today because a colleague introduced me to the idea of “give what you can, take what you need.” This is such a simple way to convey such a profound idea and I will be using it in our classroom this year- I am big on teaching the kids “Be the change…” and a big believer in harnessing your own loving energy to spread it around and make positive changes! Thank you for your work! I am so thankful that God has led me to this site. It’s encouraging and spiritually uplifting to read about all the positive impact teachers and other people even in the private sector. Your ideas will be a definite part of my classroom environment. Hello! I love this idea for our county fair, I work for a mental health non profit group and we will have a booth at the fair. I think this idea would certainly help to promote good mental and physical health. However, I need some guidance as to how to do this properly. The “Take what you need” would that be statements like “peace” “patience”, “ice cream” etc.? Would the booth workers write out these statements or would the participants, or both? 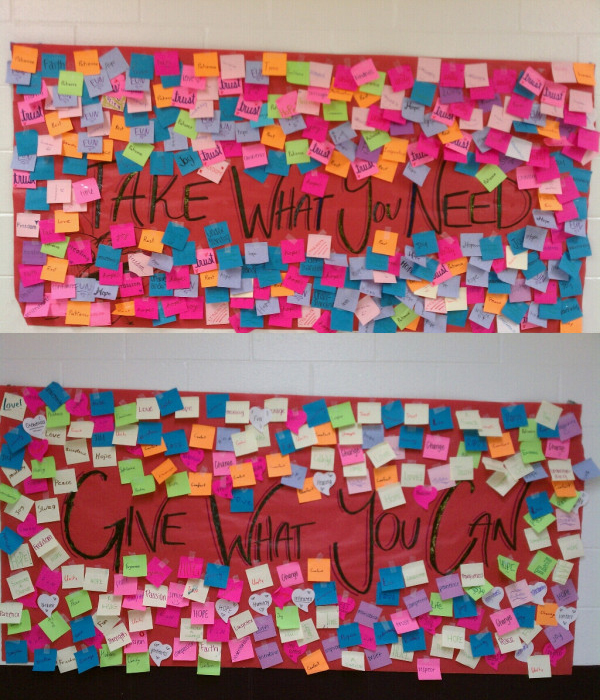 On the “Give what you can” would these be from both the booth workers and participants or mostly what the participants want to give to others? Like “I wish you peace today,” “A good game of golf”, etc. I am so excited with the possibilities of this activity and just want to make it the best it can be. Just need some guidance so I present it correctly to the community.